Wow! This season is full of celebrations! Festival of colours, Holi, is next; Valentine’s Day and so many anniversaries are on 🙂 So this recipe is dedicated to the celebrations. Cheers, with a piece of cake! This cake is a hit. Well, this isn’t just a cake, it’s a healthy cake, made of fresh fruit juices of kiwi and oranges. The one I made today was made from the juices of kiwi and pomegranate. You can bake it any day and any time. 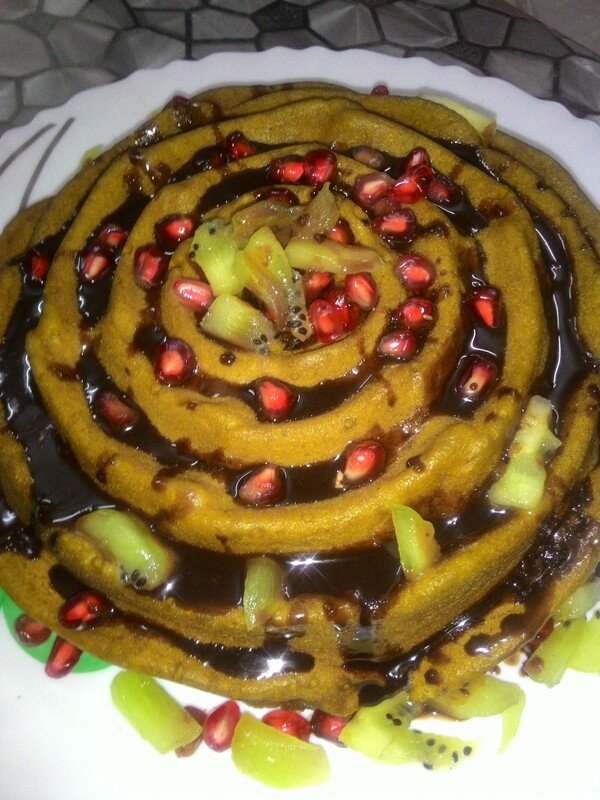 The main ingredients of this cake are pomegranate, kiwi, gur (jaggery) and wheat flour. No milk, no condensed milk and no sugar; you can even take a low-fat butter. My concentration on this cake was just to make it a healthy one so that I can include it in my breakfast or snacks list. I baked this cake in the microwave but you can try it in cooker too. Earlier, I had made chocolate cake in pressure cooker. I’ll soon share its recipe. 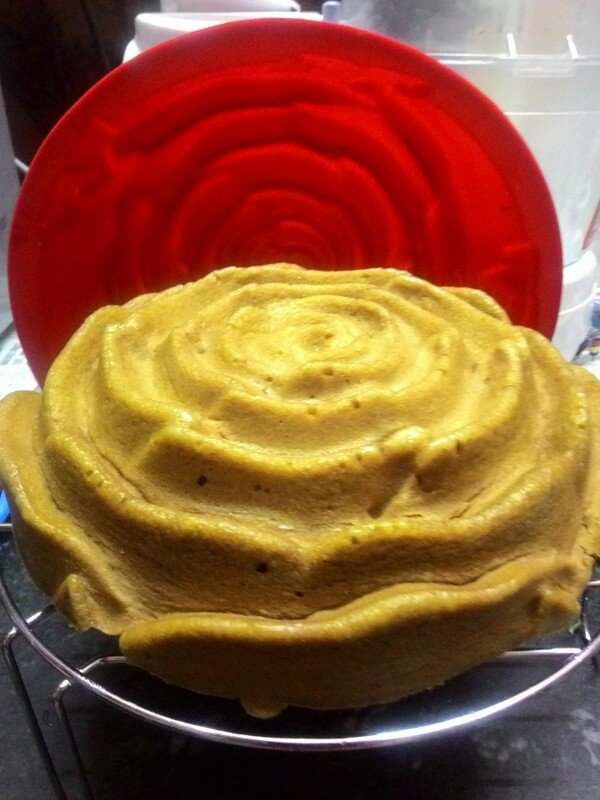 Coming back to this eggless pomegranate cake, I made it in a rose-shaped mould. Take gur in a small pan. Add three teaspoon of butter to it and heat for 3-4 minutes, so that gur melts and mixes well. Let it cool for 5 minutes. Pour it in a big bowl. By the time you can take the seeds out of pomegranates. Peel kiwi with a spoon. This is the easiest way to peel Kiwi. Cut in 2 halves. In a juicer, put 3/4 pomegranate seeds and 3/4 of kiwi. The juice should be upto 2 cups. You can also use canned juice to skip this method. Mix this juice with jaggery and butter. Place a filter/strainer over the bowl and put wheat flour, baking soda, baking powder, cornflour, salt. Mix well. Add vanilla essence and cooking oil and whisk the batter till a smooth paste. The batter shouldn’t be too thick, nor too liquidish. Now add some pomegranate seeds we had saved; just add around 20-30 seeds. Apply butter on the mould and then pour the batter in it. Tap it 3-4 times. I used a rose mould. Bake it for 5 minutes or according to your microwave’s settings, and there you are! Ready with the cake. Take out the cake from the mould on a wired-rack. 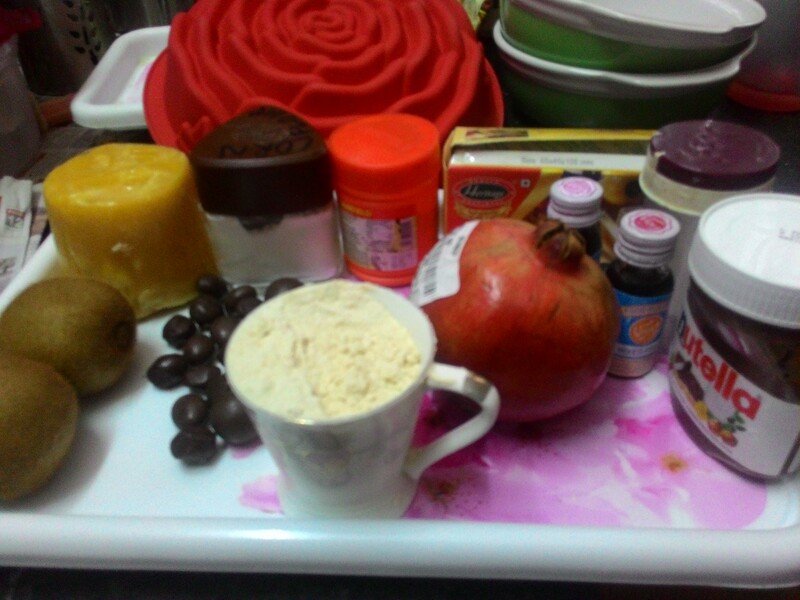 Since I used this rose mould, for dressing the cake I used thick chocolate syrup, pomegranate seeds and small pieces of Kiwi; remember we had saved 1/2 portion of kiwi while making juice? Pour the chocolate syrup on the cake, sprinkle pomegranate seeds over the cake as well as on the sides too. Sprinkle kiwi too. Ta-daaa Pomegranate Cake is ready! Very interesting recipe. I would like to try it but have no microwave oven. Could you tell me the equivalent cooking temperature and time in a regular oven? Hi Gitanjali, I’m glad you liked the recipe. Unfortunately, I bake in microwave only. I do not have regular oven. However, I went through other recipe websites for you. They recommend to use a preheated oven (200°) and bake the pomegranate cake in oven at 180 ℃ for 10 min and then 150℃ for another 15 min. 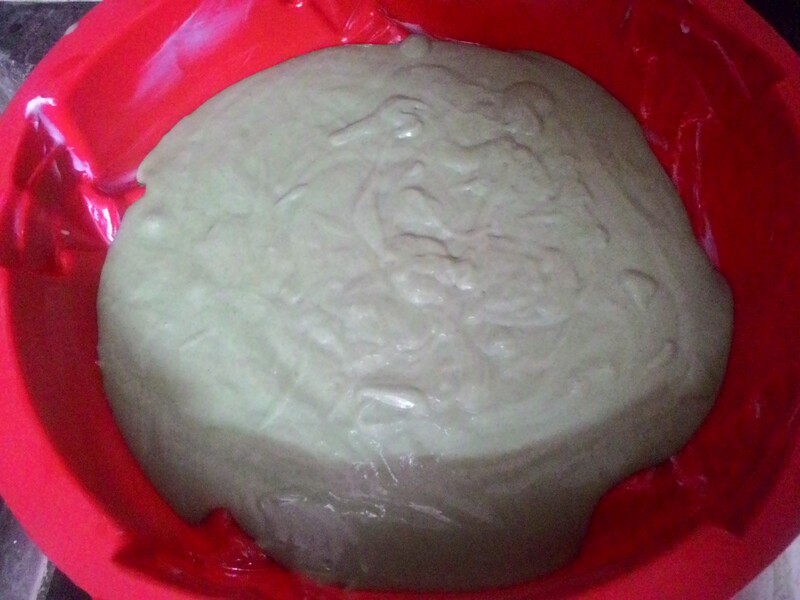 I suggest you to check while the cake is getting ready, because if the batter is less, the cake gets ready in less time.